In this book you'll find exciting new projects and techniques from the creator of Lesley Riley's TAP Transfer Artist Paper and a cadre of talented designers, including several frequent contributors to Cloth Paper Scissors magazine. With a sheet of TAP and a hot iron, you can transfer a permanent image onto almost any solid surface. This project-packed book is full of inspiration for using TAP in quilting, paper crafts, surface design, mixed media, jewellery making, and altered arts. 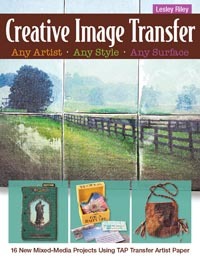 Use with encaustic, transfer images onto faux bone, and transfer to fabric, paper, wood, metal, and even glass.